You might recall that two weeks ago to my horror, I ran out of lye. I know, I know-how could I have let that happen?! Trust me, I am still asking myself that question. For those of you who missed it, you can read about it here. My new lye arrived last Thursday but with me frantically trying to get the house cleaned up, kitchen cabinets painted and everything just right, there was no time to soap. Yesterday was a day to recharge and what better way than by whipping up a batch of soap. Everything was ready to go, all I had to do was re-melt the oils & butters and get the lye water ready. This batch was done at much cooler temps that I normally work with. I would say everything was around 80 degrees when I started mixing it all together. 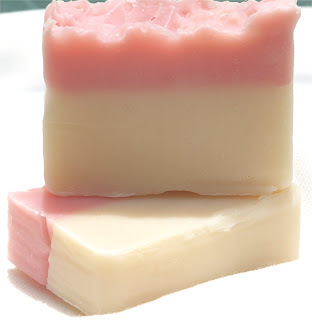 The soap whipped up in no time, super easy to work with and was scented using Lady Apple from Flickers. I sure wish we had a way to share this fragrance; it is a wonderful light apple scent. The soap set up a tiny bit faster than I was hoping for so I had to quickly place it in the mold and color the top half before I would have really had a problem. I was trying to achieve a nice red for the top (not enough time to add in the right amount) but I have to admit that I think the pink fits the bar so much better. The colorant I used was LabColors Red (those made for CP) – you can purchase them from Bramble Berry.